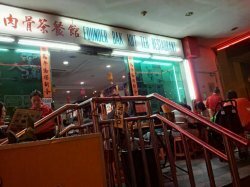 Dinner at Founder - lovely peppery bak kut teh! If you wonder why there is a long line at the steps of this restaurant daily and nightly, and if you wonder why so many photographs of celebrities grace the wall of this simple little eatery, well then I suggest you give it a try. I have been to Founder Bak Kut Teh many times, and have tried a lot of other decidedly famous ones over the years as well - but this still reigns as one of my top favorites. That is despite the queue and hurried service. Anyway, tonight the Beau and I graced the restaurant once more. The Beau took the Founder Bak Kut Teh (SGD$8.00) that came with a bowl of white rice. The meat was tender enough, and the soup was piping hot and very tasteful with strong peppery overhaul - perfect for a rainy evening like the one we were enjoying. 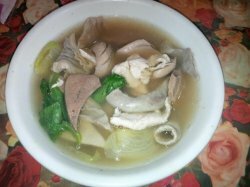 I selected the Pig's Intestine's Soup (SGD$6.50) with no rice. 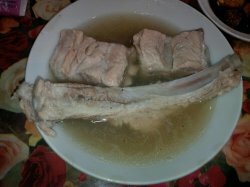 Rest assured that it would also be served with the same delicious and distinctive white pepper stock soup. The innards were all right - some chewy, some tender, some springy in texture, but all were good. The side dishes such as salted vegetables, braised peanuts, braised eggs etc are all tasty and serve as wonderful accompaniment as well. Alternatively, their Pig's Trotter (SGD$8.00) a try as well - tasty, tender and sinfully good for a once-in-a-blue-moon indulgence.